When sweet and spicy bacon is missing from your life, happiness is missing from your life. And if all it takes is brown sugar, spice, and an oven to make you fulfilled, don’t you think you owe it to yourself to make that happen? 1. Preheat the oven to 400°F (204°C). Line a large rimmed baking sheet with aluminum foil and place a wire rack on the baking sheet. Slick the wire rack with butter. 2. In a small bowl, combine the butter, brown sugar, and cayenne, using a fork to mash it all together until thoroughly blended and smooth. 3. 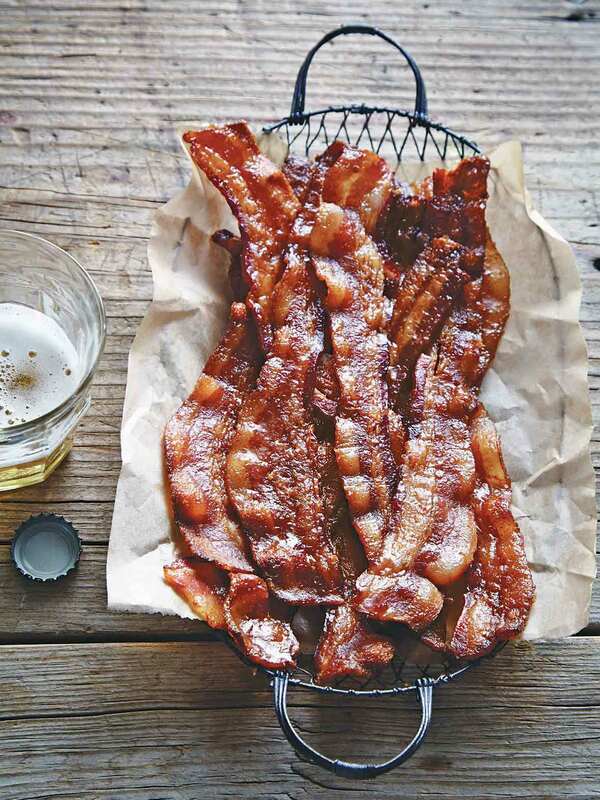 Arrange the bacon slices on top of the wire rack in a single layer so the slices don’t overlap. Divide the butter sugar mixture evenly among the slices of bacon. Spread the mixture evenly over the slices, trying to evenly cover as much of the bacon as possible. Bake on the center rack of the oven until the bacon is crisp around the edges and the sugar mixture is caramelized and bubbly, 20 to 40 minutes. You want to remove it from the oven a little before it’s as crunchy as you like since the bacon will crisp as it cools. 4. Remove the baking sheet from the oven and let the bacon cool slightly and then transfer the strips to a plate. Resist the temptation to snich some and set aside until completely cool, about 20 minutes. Let guests help themselves but don’t forget to set some aside to crumble over salads and ice cream or to slip into sandwiches or alongside pancakes. The sweet and spicy bacon is best demolished the day it’s made. 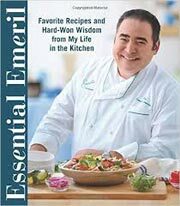 Sweet and Spicy Bacon Recipe © 2016 Emeril Lagasse. Photo © 2016 Becky Luigart-Stayner. All rights reserved. All recipes and photos used with permission of the publisher. This sweet and spicy bacon is crispy, crunchy, salty, spicy, and sweet. Translation: It’s so good it may become highly addictive. It would be great on sandwiches, salads, crumbled over ice cream, even as a topping for an iced cupcake. The list of uses goes on. Very easy to make and well worth the effort. There wasn’t a strong level of spice from the cayenne pepper, so if you want the bacon to be more spicy, feel free to add another 1/2 teaspoon or so cayenne. If you don’t care for it hot and spicy, you can eliminate the cayenne pepper altogether. I’ve made this without the butter and it works well and the flavor is pretty much the same. The sugar actually adheres better to the bacon without the butter. In the oven, the butter mixture melted and pooled on the bottom of the pan and ended up burning and creating a very smoky oven towards the end of the baking period. This doesn’t happen when the brown sugar is applied to the bacon without any butter. Just the title of this sweet and spicy bacon recipe enticed me to try it. After all it is bacon right, and who doesn't like bacon? My thoughts were to put it into a snack bag to munch on at work. My expectations were somewhat thwarted by the cook time and some were very overcooked and downright burnt. They were crumbled and saved. Overall the recipe is good and the bacon very tasty, the rest never had a chance of making as snacks. The cayenne pepper adds just the right touch and doesn’t make it hot. It just adds a subtle flavor like table seasonings. The flavor is awesome and it’s best to remove from oven when just a bit limp as it will crisp up a bit more. This candied bacon would make a great accompaniment for pancakes or eggs. Also candied bacon cheeseburgers as well as salads. It can be stored in the fridge in a resealable plastic bag for a day or two with no problem. Sometimes just a few simple ingredients we may not think of work well. This is one of those times. I’ve made a similar recipe over the years & it always disappears within minutes. I add cinnamon to the sugar and don’t use butter. It’s not needed. Disconnect your smoke detector before making this. Tee-hee! Those darn smoke detectors! I understand completely, Martha. I’ve been known to toss them across the room in a fit of frustration. I also make a similar recipe. I learned a lesson the hard way: do not attempt to drain the cooked bacon on paper towels. You either will be picking pieces of paper toweling off the bacon for hours, or, more likely, just eating the bits of paper toweling because you cannot contain yourself! If you have any leftover (HA! ), it can be frozen between layers of parchment paper. To serve, reheat as many strips as you need in the microwave. Twenty seconds for 2 or 3 strips works for me. Ah, many thanks for the troubleshooting trick, BBSTX! And the freezing trick, although as you imply, it may not be necessary that often, but this way we have it handy should the unlikely happen!